The Argentine comic strip Mafalda is published for the first time by Joaquín Salvador Lavado, better known by his pen name Quino, an Argentine cartoonist born on July 17, 1932 in Guaymallén, Mendoza Province. His comic strip Mafalda (which ran from 1964 to 1973) is very popular in Latin America and many parts of Europe. The character Mafalda — whose name was inspired by David Viñas‘s novel Dar la cara — and a few others, were created by Quino in 1962 for a promotional cartoon that was intended to be published in the daily Clarín. Ultimately, however, Clarín broke the contract, and the campaign was canceled altogether. Mafalda became a full-fledged cartoon strip on the advice of Quino’s friend Julián Delgado, at the time senior editor of the weekly Primera Plana. Its run in that newspaper began on 29 September 1964. At first it only featured Mafalda and her parents. Felipe came on the scene in January 1965. A legal dispute arose in March 1965, which led to the end of Mafalda’s Primera Plana run on 9 March 1965. 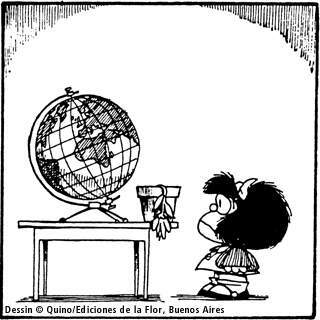 One week later, on 15 March 1965, Mafalda (the character at the age of five) started appearing daily in Buenos Aires’ Mundo, allowing the author to follow current events more closely. The characters of Felipe, Manolito, Susanita and Miguelito were created in the following weeks, and Mafalda’s mother was pregnant when the newspaper shut down on 22 December 1967. Publication resumed six months later, on 2 June 1968, in the weekly Siete Días Ilustrados. Since the cartoons had to be delivered two weeks before publication, Quino was not able to comment on the news to the same extent. After creating the characters of Mafalda’s little brother Guille and her new friend Libertad, he definitively ceased publication of the strip on 25 June 1973. After 1973, Quino still drew Mafalda a few times, mostly to promote human rights. In 1976 he produced a poster for the UNICEF illustrating the Convention on the Rights of the Child.